This area, part of the Wabbaquasset Indian country, was deeded to Captain James Fitch of Norwich in 1684 by Owaneco, sachem of the Mohegans. An earlier one having failed to act, a new committee was appointed by the General Assembly in May, 1710 to lay out the township. In October, 1714 further town privileges were granted and liberty to settle a minister and erect a meetinghouse. William Ward and John Perry were chosen as selectmen at the first town meeting, held early in 1715. This green was the center of town before the separation of Eastford in 1847. The First Church of Ashford, Congregational, organized November 26, 1718 with James Hale as minister, stood on this common. It was twice destroyed by fire and a third time by the 1938 hurricane. The Babcock Burial Ground, where many of the original settlers are buried, lies in the northwest corner of the green beyond the Ashford Academy, erected early in the 1800’s. Whitaker, awarded the Congressional Medal of Honor for gallantry during the Civil War. Under a flag of truce he received assurance that General Lee would surrender unconditionally at Appomattox in 1865. 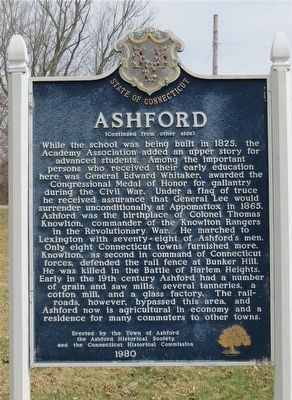 Ashford was the birthplace of Colonel Thomas Knowlton, commander of the Knowlton Rangers in the Revolutionary War. He marched to Lexington with seventy-eight of Ashford’s men. Only eight Connecticut towns furnished more. Knowlton, as second in command of Connecticut forces, defended the rail fence at Bunker Hill. He was killed in the Battle of Harlem Heights. Early in the 19th century Ashford had a number of grain and saw mills, several tanneries, a cotton mill, and a glass factory. The railroads, however, bypassed this area, and Ashford now is agricultural in economy and a residence for many commuters to other towns. 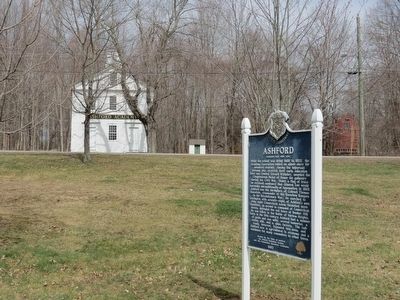 Erected 1980 by Town of Ashford, the Ashford Historical Society, and the Connecticut Historical Commission. Location. 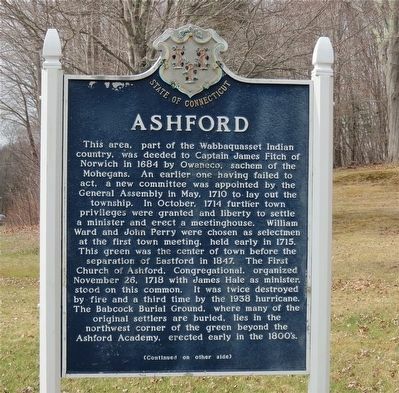 41° 52.354′ N, 72° 7.375′ W. Marker is in Ashford, Connecticut, in Windham County. Marker is at the intersection of U.S. 44 and Fitts Road, on the right when traveling west on U.S. 44. Touch for map. Marker is in this post office area: Ashford CT 06278, United States of America. Touch for directions. The Academy is believed to be the oldest public building in Ashford and was placed on the National Register of Historic Places in 1988. Ashford Veterans Memorial (approx. 2.1 miles away); Nathaniel Lyon Birthplace (approx. 2.7 miles away); John Perry (approx. 2.9 miles away); Eastford Veterans Memorial (approx. 3 miles away); Eastford (approx. 3 miles away); Willington (approx. 4.9 miles away); Abington Meeting House (approx. 6 miles away). Touch for a list and map of all markers in Ashford. More. Search the internet for Ashford. Credits. This page was last revised on June 16, 2016. This page originally submitted on April 4, 2016, by Alan M. Perrie of Unionville, Connecticut. This page has been viewed 246 times since then and 5 times this year. Photos: 1, 2, 3. submitted on April 4, 2016, by Alan M. Perrie of Unionville, Connecticut. • Bill Pfingsten was the editor who published this page.